Several weeks ago I had a terrific opportunity to watch the Shreveport (LA) Fire Department Search & Rescue Task Force and volunteers participate in the 4th annual Super Safety Saturday at the Sheriff’s Safety Town in Shreveport. 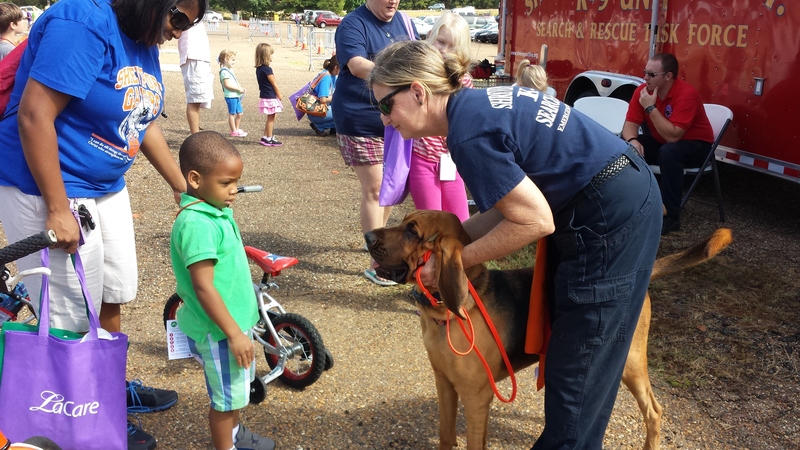 While there was certainly plenty to keep kids of all ages engaged, the highlight of the day for me was watching kids meet the bloodhounds and other Search & Rescue dogs. If you’ve browsed through the slideshow on my website you’ve seen the picture of three Bloodhounds. That’s Ginny, Brinklie, and Darcy; Ginny and Brinklie are “official” members of the SFD team. Darcy, who’s trained and handled by Maureen Kidd (one of the beta readers for my series) is learning SAR skills in addition to her work as a Pet Partners therapy dog, and she too spent the morning at Safety Town. All three dogs charmed everyone with their gentle demeanor. The handlers did a wonderful job introducing the dogs to children and explaining the work they do. 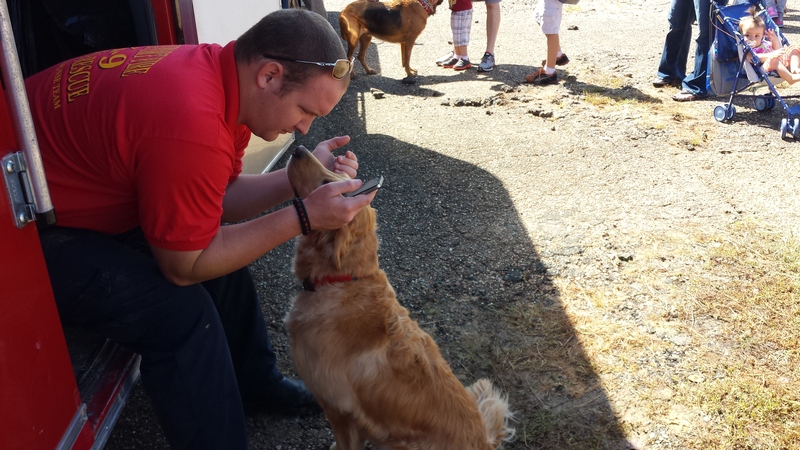 The department also had other dogs there and spent a lot of time discussing the differences between tracking, trailing, area search dogs, and dogs trained to detect human remains. I’m sure the information I collected will show up sometime soon in the Waterside Kennels Mystery Series! Watching them move through the crowd, I soon discovered that Bloodhounds are incredibly strong and require a firm hand on the leash. These are trailing dogs working from a specific scent (a missing person’s shirt, for example). They can work a scent trail that is hours old, and the presence of other people in the area doesn’t affect them. The dogs trail a specific person by following the scent carried by tiny particles of skin cells cast off by that person. If the dog has been given a good scent article and starts from the point where the person was last seen (PLS for short), then a Bloodhound (or any other dog trained in trailing) is often the best resource to use. If a scent article isn’t available, or if the PLS is unknown, search teams might bring in area search dogs. These dogs are trained to detect airborne human scents and are an excellent resource when a large area must be cleared. The area search dog will alert the handler when a “find” is made. These dogs are not “scent discriminate” so they’ll alert on every single person they find in the area. As you might imagine, that can quickly tire any dog. That’s why it’s critical that, whenever possible, searchers stay out of the area while the dog is working. The bond is deep between a dog and his handler. Meet Justin Mackey and Radar. And my sincere thanks to everyone involved for sharing their knowledge and expertise with me! This morning I received an invitation to register for a webinar titled “Yes, You Can Write A Novel in One Month” My first reaction was….one month? Really? Who does that? “National Novel Writing Month (NaNoWriMo) is a fun, seat-of-your-pants approach to creative writing. On November 1, participants begin working towards the goal of writing a 50,000-word novel by 11:59 p.m. on November 30. Valuing enthusiasm, determination, and a deadline, NaNoWriMo is for anyone who has ever thought fleetingly about writing a novel.” You can read more at http://nanowrimo.org/ and toss your (literary) hat in the ring if you’re so inclined. Deadly Ties, the first novel in the Waterside Kennels Mystery Series, is just under 100,000 words and took me a lot longer than a month to write (years, actually). So 50,000 words will probably be a milestone rather than the finishing line for the second in the series (already in the works). Still…I confess I’m intrigued by the idea, and found myself hooked when I realized there are fellow writers in my part of the world who have banded together in the spirit of NoNoWriMo to jump into the action and get their work moving. Since several reviewers have mentioned their eagerness to read the next book in the series (tentatively titled Death Tracks), I’m going to join the campaign. I’ll keep you posted on my progress! Researching my new book Deadly Ties turned out to be a lot of fun—and a bit more exciting than I expected! I knew I needed some extensive research in order to create the story I wanted to write. That desire led me out into the woods and deep into caves on the trail of Ozark legends. Now, I admit I was skeptical when I heard some of these treasure stories. In fact, one of the characters in my book feels the same way! But after meeting Phillip Steele and reading his stories, I was hooked. That might explain how I ended up far underground in a place called the Old Spanish Treasure Cave in Benton County, Arkansas. Well, one memorable day a guide had taken a couple of us through the cave. (A cool place to visit, by the way.) We happened to be the last through and had reached the bottom when the lights went off! Imagine absolute blackness and complete silence, and you’ll have an idea of what that cave was like. Now imagine tons of rock over your head, and nothing but a skinny passage way leading you to the surface, and you can probably appreciate that I was breathing just a tad faster than usual! But the story has a happy ending. We got out safely and I got some terrific material for a book! What about you? What sort of treasure do you seek? And how far are you willing to go in search of that treasure?